Somebody putting together the Enrolled Actuaries Meeting schedule had fun with this one. Section 409A was added to the Code by the American Jobs Creation(ism) Act of 2004. As regulations have gone through an evolutionary process, employers have struggled to comply. A diverse group of speakers show you how job creation has evolved into intelligent design. Who says actuaries don't have a sense of humor? I got into a little slapfight on a blog this week with someone who claimed, among other things, that, "We do know that rates of young men entering college these days is in the toilet". There were no citations, of course, because that isn't the point of a slapfight, but it made me curious. So as long as I was avoiding some particularly tedious work this weekend, I thought I'd find out. 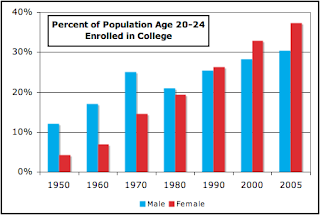 Sure, enrollment rates among males aren't growing as quickly as among females, and achievement among females has finally caught up. 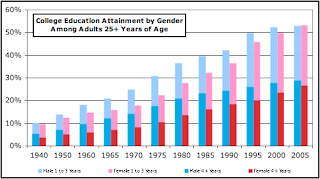 There was perhaps reason for concern when male enrollment dropped from 1970 to 1980, although there were extra incentives for young men to be in college in 1970 that didn't apply in 1980. All in all, though, it's a bit much to be calling record-high levels of enrollment and achievement "in the toilet." Next time, I'll tell him so. I walk to work. A mile and a half each way, mostly downtown. I've been hit before, although it wasn't serious, and the close calls have replaced coffee as a stimulant some mornings. Too many people are just too intent on where they want to go to look around and see who may be affected. In order to counteract this, I make a lot of eye contact with drivers, not all of it friendly. If someone creeps up on the crosswalk as I'm crossing, their bumper gets a dirty stare. If they do it again, they get a special, just-for-drivers, WTF look. Someone who's already in the crosswalk (even though no one ever manages to turn there against the light) may get a knock on the hood to let them know I'm there and using my right of way. This may not make me the most ingratiating spokesperson for pedestrians. But as long as my life and other things I hold dear (my legs, my mobility, my independence...) are at stake, I don't care. I'm much more concerned that people know there's someone between them and their destination, someone besides them who has a stake in what they're trying to do. You grow up with them. They're what you know, so they're normal, right? Then, after years have passed, you look back and blanch. We acknowledge that Tigger is gregarious and affectionate, but he has a recurrent pattern of risk-taking behaviours. Look, for example, at his impulsive sampling of unknown substances when he first comes to the Hundred Acre Wood. With the mildest of provocation he tries honey, haycorns and even thistles. Tigger has no knowledge of the potential outcome of his experimentation. Later we find him climbing tall trees and acting in a way that can only be described as socially intrusive. He leads Roo into danger. Our clinical group has had its own debate about what the best medication might be for Tigger. Some of us have argued that his behaviours, occurring in a context of obvious hyperactivity and impulsivity, would suggest the need for a stimulant medication. Others have wondered whether clonidine might be helpful, or perhaps a combination of the two. Unfortunately we could not answer the question as scientifically as we would have liked because we could find only human studies in the literature. The whole thing is here. Quite entertaining. 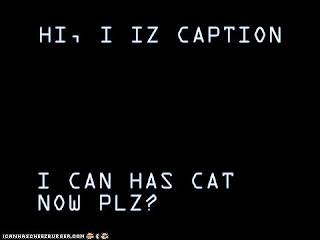 Edited to add: Found via Podblack. Lots more good stuff there, too. I'd have credited it earlier, but tabbed browsing is a great way of losing sources. I joined Facebook last weekend. There are folks I'd like to spend time with who are using it to arrange meetups, and I want to be a part of that. But I'm still ambivalent. I've spent most of my life resisting community. I was miserable in Girl Scouts (really, who packs nail polish and cute outfits to go to camp?). School was one arcane set of rules and expectations after another, very few of which actually involved learning. Freedom finally came with a transfer to the U of M, which was big enough to pull communities apart into individuals. Every job I've had I've shredded the fixed job description, so I'm the only person doing exactly what I'm doing, and I'm working with people across the company. Some of my disinclination toward community is natural introversion. I can spend days on end alone without noticing. I can go months or years without talking to people I really like. I read and appreciate blogs while rarely needing to contribute my opinion. None of this is community-building behavior, and communities reward active membership. Some is contrariness. I don't know how much is natural and how much is survival strategy, but I have an unholy love of argument, counterexamples and logical loopholes. The more time I spend as part of a group, the more I emphasize me/them differences, the more I pick at the underlying basis for cohesion. (Strangely, I often don't hit this point with individuals.) This does not always make me popular with the group. Some is a really strong identity. I've spent years figuring out what I like, what I want and what I'm capable of. Yes, my identity evolves, but the parts that aren't in flux are quite solidly fixed. Even the most diverse community, over time, tends to develop its own identity. "We think..." "We believe..." Swinging off the ends of bell curves as I often do, it can come down to a choice between the group identity and my own. Which do you think I'm going to go with? So I tend to drift into and out of communities. When I enter, I do so gingerly. When I leave, I generally keep in contact with one or two individuals. Facebook could be a great way to hang onto these people. But its purpose is to build community, so I'm a little twitchy at the moment. I don't know his name, but he's awfully cute. On our way to work, Ben and I pass a tiny fenced yard. Every month or two, there's a very large German shepherd hanging out, deafeningly defending his territory. We greet him when we pass, saying, "Hello, puppy." in the tones reserved for the cutest dogs, and offering him our hands through the chain link fence. He always sniffs and settles down. On Thursday, instead of settling down, he pawed at the chain link. Then he reared up and came down on both forelegs, rubbing his nose on the snow. Puppy wanted to play. We were tempted. We really were. But even if we hadn't needed to go to work, something tells me the owners--the people who keep an oversized shepherd in their tiny yard on the edge of downtown--wouldn't be thrilled if we showed up on their doorstep saying, "Your guard dog just invited us to play. Do you mind if we hang out in your yard for a little bit?" So we just won't tell them. But I still have a new friend.